May was a month for seizing weekends. 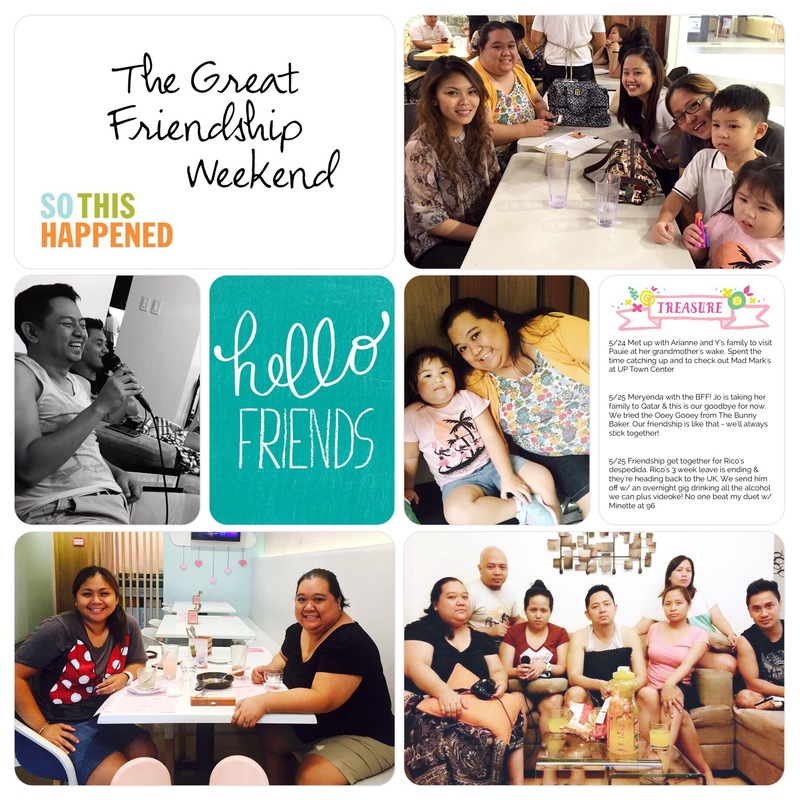 There was the Pacquiao-Mayweather weekend, and then our Staycation at the Rockwell, then I had The Great Friendship Weekend. May 25th was US Memorial Day and it meant no work for my program. Instead of planning a weekend trip away with the family, I decided to get in touch with friends and see if anyone was up for some no-good 🙂 Good thing, most were in the mood for just that! After the extended lunch, I met up with my College girlfriends at Pauie’s grandma’s wake. It was a sad occasion, but we’ll take any opportunity to catch up on each other’s lives. We weren’t complete, but Yrish came with her husband and kids. Badong couldn’t get over my goddaughter Sab! She was one of our flower girls and she’s grown big in the last 6 months! She is so cute though, and really really adorable. And her brother is such a Kuya. From the church, we walked to the nearby UP Town Center for some grub, and a little shopping too. It was soooo hot outside it felt like we were literally melting. It was a short walk but both Badong and I were winded. So unfit, that’s what we are. Unfit. Haha. The next day, I had two things on my agenda – meet up with the BFF, and then with the Friendships. This is only the second time this year that the BFF and I are meeting up. The first was with his little boy, in between travels, and this one was just before they left again – this time for Qatar where they are hopefully settling down for a long while. They spent a year in Australia but decided to pack up and try their luck in the Middle East once more. Before then, they were based in Dubai. Anyway, we don’t know when we’ll see each other next, I hope I get to fly out to her then! Hehe. I decided to bring her to The Bunny Baker Cafe and Cake Studio. It’s a cute place and they serve good food. It’s also located in the same building as my wedding reception and I know Jo would appreciate checking the place out. We shared the Ooey Gooey Dessert – a decadent brownie ala mode on a skillet. After saying our goodbyes – I went grocery shopping for my next stop – The Friendship Send Off for Rico. The gang was already at a rented condo unit at the Eastwood and I was getting more supplies. No kitchen duty for me – God forbid – but I did bring the videoke! It’s a good thing my friends are talented cooks. All I had to do was bring some stuff, and then sit back, and relax. But that night wasn’t just about eating and drinking, and not even just videoke. We actually got some serious talking done – about work, life, and relationships. I love having different sets of friends and that I got to see most of them this weekend. I would spend a lot of time regularly with all of them if I could, I am just so happy that even time apart isn’t reason to drift apart. There are still friends I need to setup dates with and it’s good to know that there just out there somewhere. Honestly, I didn’t think I would make friends as an adult so I am so thankful to have found my tribe at work and that our relationship has gone deeper into friendship. Now that I’m in a different program, I don’t see them everyday anymore but the bond is stronger than ever. Not expecting. Yet. Where do broken hearts go? Wow, you’ve been busy! Friends are treasures, it was good that you had time to catch up. Good laughs and ultimate bonding, what a great weekend! The last time i went out with friends was years ago, hahahah I know I am missing out on a lot of things already. My friends live far away from my place, good thing theres Facebook. You had a busy weekend. It’s so nice to catch up with friends once in awhile. It is very great to meet old friends and have enough time to bond with them even for a few hours.I hope to have a meet up with my friends and classmates too. Awww, this was some fun weekend! I hope when I grow up to I still get to keep in touch with my friends, college palang medyo hirap na kami e. 🙁 Do you have any suggestions how I can keep in touch with them besides going on a getaway? Hehe. Thank you! You really had a great friendship weekend indeed! I wish to see my friends often too even on weekends only. Weekend well spent! Love the bonding moments! So much fun for sure! Ron´s last [post] ..Want To Move Out Of An Apartment With Ease? Try These Tips! It’s so nice that you still find time to meet your friends. This is what I really miss back home, being able to see your friends, spend quality time with them. Right now it’s so hard for all of us to meet up since most of us lives outside of Pinas now. I also enjoy spending time with friends. There is a long weekend coming up. I need to check my friends if they are free. Katrina Centeno´s last [post] ..Thank you, Nuffnang! I miss having a weekend with my friends and catching up. My friends are qquite busy wih their own lives and some are even abroad. How I wish we can have a reunion. Oh! You made me missed my friends. It’s been years since we last show each other. Ang layo naman kasi namin sa isa’t isa. Hay, how I wish mga kapitbahay ko lang sila, hehe. I recently lost a few numbers of friends because of misunderstanding. I felt a little sad but I know it’s God’s way of telling me that some relationships will come to an end. I’m still thankful for friends who sticks with me through thick and thin. The photos shows it all, great time and friendship all the way. I’m going to visit that cake studio Sis para kasing ang sarap. Thanks for such great photo.